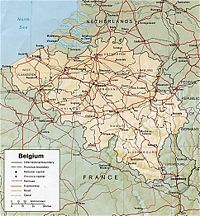 In Belgium, there are no "national" parties operating on both sides of the linguistic border. Consequently, elections are a contest among Flemish parties in Dutch-speaking Flanders and Francophone parties in Wallonia. Only in officially bilingual Brussels can voters choose from either Flemish or Francophone parties. This page was last modified on 2 February 2019, at 17:56.